Here's what every feline parent needs to know about dental diseases in cats, like stomatitis, periodontal disease and tooth resorption. Dental diseases in cats are common — but hard to diagnose. While agonizing pain might get you to run to the dentist, cats in pain just carry on. For a cat to signal “my mouth hurts,” the pain has to be over-the-top excruciating. At this point, many cats refuse food, but it’s not because they’re finicky — it’s because eating hurts. “That’s probably where the idea that cats are finicky comes from,” said Bloomington, Minnesota, veterinarian Dr. Kate Knutson, a past president of the American Animal Hospital Association. She said when there’s bacteria at and around the gum line, that bacteria soon travels through the cat’s system, potentially affecting kidney and even heart function. Certainly, it’s not healthy to have an unhealthy mouth. 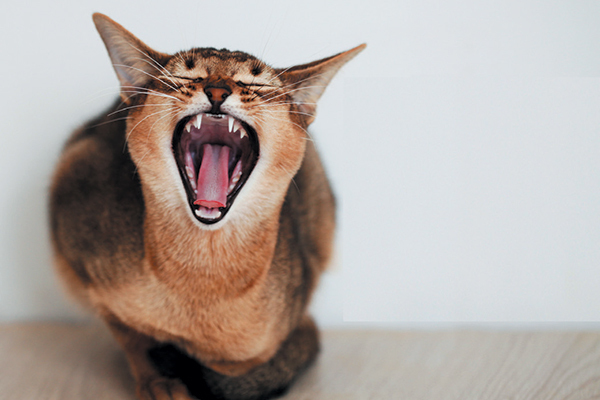 There are many types and variations of dental disease in cats; veterinary dentist Dr. Jan Bellows of Weston, Florida, immediate past president of the American Veterinary Dental College, says three dental diseases in cats are especially important to know about. What are the top dental diseases in cats? Photography by Norman Chan / Shutterstock. Cavities (common in people) are created from the outside in. Bellows explained that tooth resorption begins at the root and travels up. Leave it to cats to be different. Tooth resorption is rare in people; it’s increasingly diagnosed in dogs (mostly because veterinarians have begun to look for it and have X-ray equipment to find it), though the issue is far more common in cats. Prevention is best — except that no one knows how to prevent it. At one time, diet was thought to be responsible, but that’s not the case. One thing we know: Cats who’ve had the calici virus are predisposed to tooth resorption. If one tooth is affected, Bellows said, there’s a 75 percent chance that at least one other tooth and often several teeth are affected. Obviously a wincing cat is a hurting cat. The only way to effectively remove the pain is to remove the affected teeth. Again, leave it to cats. This condition occurs when cats seem to become allergic to their own teeth. Despite the fact that stomatitis is common, relatively little is known about this immune-mediated disease. Stomatitis is often diagnosed by veterinarians observing a crazily inflamed bright red mouth. Some veterinarians deal with the inflammation using steroids and an antibiotic. “This can temporarily make a cat more comfortable, but it’s hardly a very long-term solution,” Bellows said. Before long, the cat requires a higher steroid dose to control the inflammation and eventually can develop diabetes (as a side effect of the steroid). And some cats become resistant to one antibiotic, so another has to be tried. Sanos veterinary dental sealant: This one-step application by a veterinarian helps keep the sub-gingival gum line of cats (and dogs) clean. Sanos is applied after every professional dental cleaning. Wipes: Bellows said to choose a product with chlorhexidine and sodium metaphosphate. Water supplements: Just as the name suggests, you add these to your cat’s water. Some water supplements are clinically proven to reduce plaque by a remarkable 85 percent to 88 percent in cats. To learn more about food, treats, and other products proven to support dental health, visit the Veterinary Oral Health Council. Tell us: Have you ever encountered dental diseases in cats? 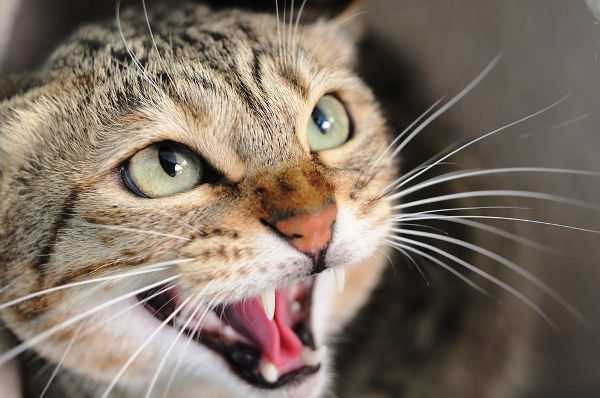 Ask a Vet: Why Do Cats Grind Their Teeth? About the author: Steve Dale is a certified animal behavior consultant. He is a national newspaper columnist (Tribune Content Agency); heard on WGN Radio, Chicago; host of the nationally syn- dicated Steve Dale’s Pet World and author of the e-book Good Cat, among others. He’s a founder of the CATalyst Council, and serves on the boards of the Winn Feline Foundation and Tree House Humane Society, Chicago. Follow him on Facebook and Twitter. Pingback:Boost Your Dental Wellness With The Following Info! – Do You Need a Greenwood Family Dentist? My cat Tiger has gotten Stomatitis at least 4 times in the last few months and I suspect that she has it now because she is doing the run away from mom thing when I put her food down. I can’t get her to the vet until this weekend because she is an outside only cat and the vet is closed by the time she crawls into her bed at night which is the easiest way to get my hands on her but on the weekends they are open 24/7. This time when she goes back I’m going to get them to start on her blood work so we can get her mouth x-rayed soon. The other vet visits they just gave her antibiotics and pain meds and said they’ll see how long it takes this time before the next episode. This time I am going to insist that we get her x rays done soon because I am so tired of seeing my little girl in pain and sick so much. She has always been the toughest and bravest little cat out of my fur kids so I have no idea how or why stress is causing this issue with her. And the other times she went they said her teeth didn’t look that bad for a 3 year old cat either but I told them that although she and her brother only live outside, I still take care of them as if they were inside cats only giving them healthy treats and food. One of my neighbors just tosses a bunch of food in a pan for her ferals but my kids have their own food bowls (for wet and dry), water bowl and I keep those and their beds clean regularly and they only get treats that are good for them like Greenies hairball smart bites or the skin and fur Greenies. My cat takes her paw over her and then the area of the mouth. Is that a signal of Dental disease? what are the signals and are they easy to spot. I waited too long for two of my cats when they had dental issues. Both times, my vet said they needed dental cleanings, but I waited, and waited. One cat got to the point where a bad tooth got loose and he couldn’t close his mouth. One cat was pawing at his mouth, and falling to the floor after every time he ate wet food. So yes, if you notice anything different about your cat, bring him to the vet to get checked out. If they are pawing at their mouth and look like they’re in distress, especially after eating, that is definitely a sign. Thanks for reaching out. This might be dental disease. We suggest bringing your cat to the vet for a thorough examination. Got an estimate for cleaning i have an 8 year old with gingivitis. Cost starts at 450.00 . I was told that doesnt include whatever procedures to be done. So when i go pick him up the final bill could be as much as 12oo.oo. Seriously. I am committed to my pets health. I was told most of that cost is for anesthesia.